For the past two and a half years Leshelen has been carefully restored by shipwrights at the Wooden Boat Centre in Franklin, Tasmania. Recently it was returned to the water where the final tasks of its restoration will be completed. The Hummerston family from Brisbane, are the proud owners of the vessel. “Janet and Bruce Hummerston were not even ‘boaty’ people when they took on the restoration project,” said Anne Holst, Manager of the Wooden Boat Centre. “It would be fantastic if all old wooden vessels had supporters like Bruce and Janet. It would be possible to keep many more significant heritage vessels on the water if this was the case,” said Anne. Leshelen is a 36ft carvel built motor launch planked in Huon Pine. It was designed by RH Thompson, and was built by its first owner, R Torrents of Launceston. It is fitted with a BMC 50hp diesel engine and was first launched in Launceston in 1952. The vessel is considered historically significant and is listed by the Association of Heritage Boat Organisations, Tasmania. The boat had been donated to the Wooden Boat Centre in a fairly decrepit state, knowing that the centre had a group of talented boat builders on site. So it required a significant amount of work and expertise. This included replacing a section of the stem and 56 of the ribs, re-splining the hull and remodelling the cabin. Adrian Dean watching on as two of his students Doug and Mick put the rivets and roves in the topside plank. 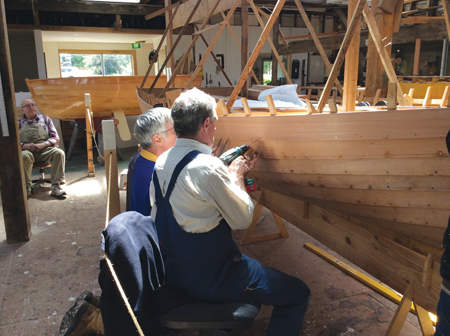 David Nash led the boatbuilding restoration team as they worked sporadically on the rebuild. Work had to fit in with various other commitments and tasks in the shed. It also allowed the Hummerstons to be part of the works program, with Bruce spending his annual leave painting and varnishing various parts of the boat. “Bruce has really enjoyed his visits to Franklin,” said Janet Hummerston. “He loves working with his hands and has been available to make decisions about the restoration.” The boat is designed for family cruising so will soon be central to family recreation and relaxation. The Hummerstons were on a year long trip around Australia, when they became interested in the project. They just happened to take a tour of the Wooden Boat Centre when passing through Franklin, when they found the boat in a state of disrepair. Early next year the family will be enjoying their first Australian Wooden Boat Festival with Leshelen taking its place amongst similarly beautiful craft on the water. Students Robert, Sam and Nobby fastening ribs into a Huon Pine Clinker dinghy. “This is just some of the great work carried out by the Wooden Boat Centre,” said Alan Cato, president of the Franklin Working Waterfront Association that own the Wooden Boat Centre. “We also welcome tourists to visit the boat shed, build new vessels and wooden craft commissions, as well as running a range of short courses in all aspects of wooden boatbuilding and maritime skills”. The Wooden Boat Centre (WBC) has been community owned and operated for more than three years now and is run as a ‘Not for Profit’ social enterprise. This was made possible due to a huge fundraising effort by the ‘community’ to purchase the centre from the previous private owner in late 2014. The mission of the Wooden Boat Centre is to maintain the knowledge and skills of traditional wooden boat building. To this end we run a range of short recreational courses to teach all aspects of wooden boat design, construction and maritime skills. An accredited training program is currently in development and should be available later this year. Students are welcomed from Tasmania, interstate and overseas to learn traditional skills like clinker and carvel construction and restoration techniques. They can learn modern wooden boat building techniques whilst building plywood tenders or strip planked kayaks or canoes. Twice a year a six day course to build a ‘skin on frame’ kayak is offered to build a modern interpretation on an Inuit design. 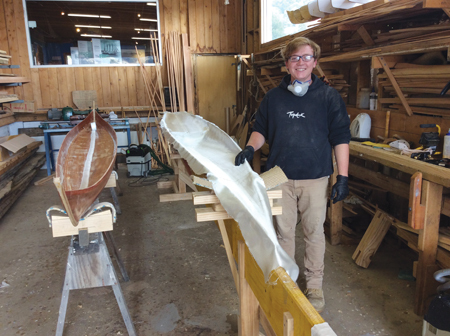 Max Kemsley glassing tghe deck of his strip planked kayak. The WBC’s students are a mixture of young and young at heart. They are people wishing to extend their wood working skills for a mixture of hobby and career aspirations. Often people come to do a short course because it is a nice balance to the work they normally do. “We welcome everyone, from chippies to engineers and surgeons,” said Anne. 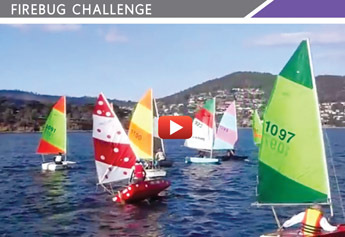 The WBC have also recently started to offer week by week experiences in the boat shed. People can book in for a week of their annual leave or for a shorter or longer period of time to test out if boat building is for them. People also come to learn a specific skill like steam bending. This is offered as hourly or weekly tuition. “It makes for an interesting and ever changing group of people working together in the shed,” said Anne. 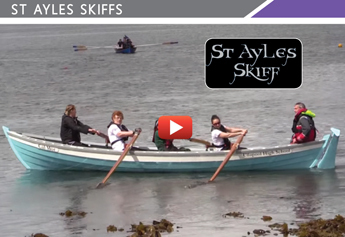 “All with the aim of sharing traditional skills. This can be the difference between people feeling they have the confidence to take on an old wooden vessel to restore and maintain,” said Anne. The WBC employs a group of five shipwrights and boat builders that specialise in wooden boat construction and restoration. 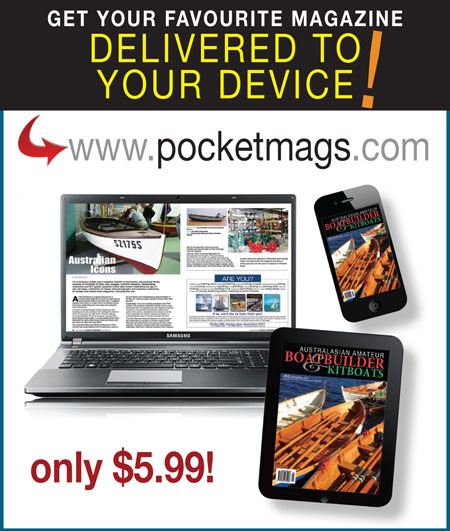 The boat builders are the backbone of the operation. Their work varies from assisting boat owners with repairs to building new boats and everything in between. Peter Laidlaw, has worked in the boat shed for most of the past 25 years. Last year he completed a commissioned 5.5m clinker double ended Viking boat replica sailing craft for a client in Sydney. This vessel was complete with a dragon’s head figurehead fore and snake’s head aft, with shields made by a local Viking weapons artist, Vaughn Morphett. The boat was commissioned to showcase Huon Pine and for the rowing and sailing enjoyment of small groups. 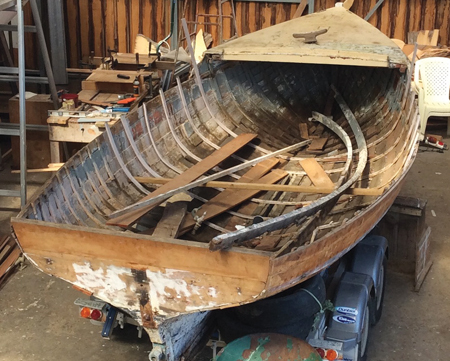 Peter is currently working on the restoration of an old Couta boat, thought to be 130 years old. This vessel was built at Gravelly Beach in northern Tasmania and had been one of the 18 footers that were the fishing fleet in days gone by. The owner of the vessel is looking to restore her back to original, so will reinstate the mast and rig for sailing. Again this vessel is expected to be at the 2019 Australian Wooden Boat Festival with a new lease of life. The Wooden Boat Centre is often asked to assist the restoration of old wooden vessels. Similarly they are often offered ownership of older craft as the maintenance requirements get too much for the current owners. The old Couta boat on delivery to the shed for restoration. Currently the WBC enjoys support from 38 volunteers, who share the passion for wooden boats. Some of these people assist as tour guides, telling stories tall and true about wooden boat building and the history and ethos of the work carried out in the boat shed on the banks of the Huon River. Others work in the front of house welcoming tourists to the region and site. Visitors to the WBC can experience the centre on a half hour guided tour and can also purchase a small range of locally crafted souvenirs. “A lot of our souvenirs are made on site by a small team of talented volunteers,” said Julie Hinks the ‘front of house’ coordinator. “We try to use every bit of our precious timbers, so nothing is wasted,” said Julie. “So we have Francis making sculpted fish, Kristine making wooden jewellery, Pete making little boats, Neil making chop sticks and even Jen and Christine making little bags for Huon Pine shavings. It’s a real team effort,” said Julie. 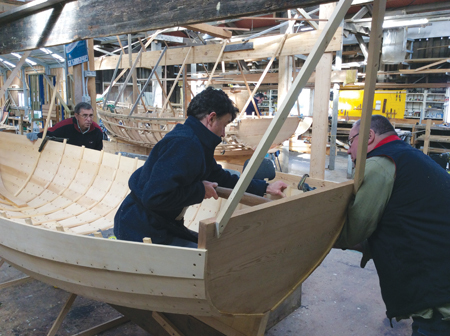 Whilst visiting people can watch aspects of traditional boatbuilding happening around them. There are students under instruction constructing small craft and there are a range of items being made. 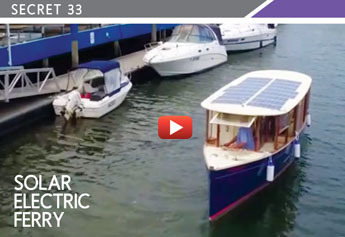 Adrian Dean has also been associated with the Wooden Boat Centre for the past 25 years. He began his boat building career at Muirs Boat Yard in Battery Point in 1948. Later in 1992 when ‘the school’ established he worked as one of the first instructors. Currently as an 86 year old, he is still instructing a group of five mature students whilst building ‘one last boat’, a 16ft clinker built workboat. This vessel is one of Adrian’s designs and is planked in King Billy Pine that has been in storage since 1960. Adrian and his team are in the shed each Tuesday. As well as traditional construction and restoration the WBC also offer modern construction techniques in plywood and using strip planked construction. This wooden construction technique is also offered as short courses, with three kayaks and three Canadian canoes leaving the shed to date.